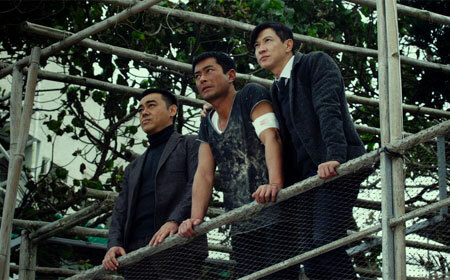 Lau Ching-Wan, Louis Koo and Nick Cheung in The White Storm. The Skinny: Heroic bloodshed actioner has good action and a solid set-up, but the second-half drama stops the movie cold. Also, the bromantic manpain becomes too much even for a film of this genre. Worth a look for the stars and the riffs on classic, better Hong Kong films. Also, Nick Cheung = awesome. Benny Chan does John Woo for The White Storm, a modern-day actioner infused with copious amounts of bullets, brotherhood and bromance. Chan’s heroic bloodshed riff is less pronounced than John Woo’s 20th century variety – because audiences nowadays are too cynical to accept Woo-level violence or emotions – but it’s got the same feel, what with omnipresent images of men crying and smiling amidst bullet-riddled bodies. This type of red meat man’s movie will always have an audience, and it helps that Benny Chan enlists Louis Koo, Lau Ching-Wan and Nick Cheung as his leading men. The presence of such revered, if not award-winning, actors goes a long way in making White Storm a crowd-pleasing action-drama. That said, the film has some issues, not least among them the fact that Benny Chan is the director. Chan is great with action, but with everything else? Not as much. Undercover cop So Kin-Chow (Louis Koo) is getting tired of running with the triads, even with his childhood friends and fellow cops Ma Ho-Tin (Lau Ching-Wan) and Cheung Tsz-Wai (Nick Cheung) acting as his handlers. After one final raid to take down a drug dealer (Shi Yanneng a.k.a. Xing Yu), Chow is slated to go back to regular cop duties and, hopefully, a normal life with his pregnant wife Chloe (Yolanda Yuan). Unfortunately, the big muck-a-mucks want Chow to follow one final lead: He must go with Tin and Wai to Thailand to pursue druglord Eight-Faced Buddha (Lo Hoi-Pang with wacky hair). Unsurprisingly, Chow’s reaction is “Not cool, dudes,” but he’s cajoled into going along by another round of his friends singing the theme song to the 1976 drama “Luk Siu-Fung”, a stirring tune about swordplay brothers who band together and triumph in jiang hu. A fitting if unsubtle parallel courtesy of Benny Chan. Unfortunately, things in Thailand don’t go as planned. The team deals with betrayal and bad bureaucracy, not to mention untimely cowardice and a long speech about friendship from Nick Cheung. Everything goes pear-shaped and our heroes (most of them, anyway) return to Hong Kong with their friendship torn apart. Tin is professionally shamed and now walks with a limp, Chow is separated from his wife and daughter, and Wai – well, you’ll just have to see what happens to him. Five years pass and the Eight-Faced Buddha returns for even more evil shenanigans. Will our heroes let bygones be bygones and become brothers once more? The White Storm does enough right that its twists and turns may not seem predictable – that is, unless you’ve seen a trailer, in which case you’ll have an idea where this all goes. But this story has proven dramatic power and, considering the actors involved, qualifies as one of the year’s most potent set-ups. A set-up won’t ensure victory, however. The first half of White Storm is very promising, and defines its characters and situations in solid if not completely efficient fashion. Exposition is a bit obvious, but by the time the film hits its Thailand-set turning point, it’s firing on all cylinders. Pinned down by Eight-Faced Buddha’s men, Tin must make a terrible choice that ultimately sets up the rest of the film. This harrowing build-up feels earned, but the rest of the film doesn’t match up. For one thing, White Storm takes half its length to reach its turning point, leaving not enough time to address everything. A Better Tomorrow completed its set-up in its first third, allowing ample time for bromantic interludes and necessary development. White Storm only has an hour to get its heroes on the same page, and the narrative obstacles created are so large that it requires too many shortcuts and too much suspension of disbelief to accomplish that. Also, the manpain is just enormous. Each actor gets Award-baiting crying clips with moments of spoken contrition coming stiffly in succession like each actor is waiting for his turn to step up to the microphone. One guy cries about his pain, then another, then another – these are long speeches that sometimes occur at the wrong moments, with the film occasionally stopping cold to accommodate the waterworks. Chan is invested in his characters but draws them in a labored and obvious manner, plus it seems that he can concentrate only on action or emotion at any given time. The lead characters are fine as heroic bloodshed archetypes, though a better connection between each character and their fate would be good. The film also lacks a really good villain (Lo Hoi-Pang is fine, but cruises mostly on his ridiculous hairstyle), and the female characters are little more than accessories. This is a man’s movie, all right. At least Chan got the right men. Louis Koo and Lau Ching-Wan have chemistry to spare, and fit their given roles neatly. Neither is a revelation, as each is given a character that plays off the actor’s past strengths, i.e., Lau Ching-Wan as the intense leader, and Louis Koo as the sweaty, potentially weak undercover. Nick Cheung is the biggest surprise and steals the movie handily, though the filmmakers also give him the most to work with. Cheung’s turn allows for some playfulness amidst all the blood and bromance, and it’s a flaw that his is the only character that has fun. Even in his most nihilistic heroic bloodshed pictures (think Bullet in the Head), John Woo would give his heroes some playful moments of brotherhood, but all we get here is the occasional singing of that TV theme song. Manly bonding can get a little corny, but so what? White Storm needs a little more cheese to go with its whine.